Soldiers stormed the national radio headquarters in Libreville, Gabon’s capital (file photo). 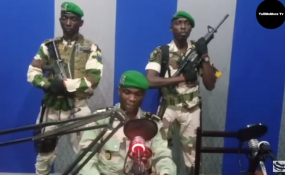 On 7 January, a group of young military officers in Libreville, Gabon, tried to overthrow the government of President Ali Bongo Ondimba. The challenge to the Bongo family dynasty came in the context of widespread discontent with government and harsh socio-economic circumstances. The lack of public support for the attempted coup could be an indication that young Africans are starting to prioritise the ballot over the gun. Africa has had its fair share of coups, dating back to the immediate post-independence period. At one point they appeared to be the most fashionable option for a change of power. To date a total of 204 coups (both successful and unsuccessful) have occurred in Africa, with Sudan and Nigeria accounting for 14 and eight respectively. Substituting a civilian government for a military junta through a coup has more often than not been bloody, costing the lives of both soldiers and civilians. As a result, attention is increasingly being paid to the people leading the coups, the motivation behind their actions, and their actual ability to overthrow the government and hold on to power. Young people have been responsible for leading some of Africa's most memorable coups, triggered mostly by dissatisfaction with political governance and despondence with the status quo. In 1979 and 1982 a 31-year-old Ghanaian flight lieutenant, Jerry John Rawlings, led two successful coups in Ghana. These were driven by his desire to have a government less dependent on its hitherto colonial master, and free of corruption. In 1983 Thomas Sankara, one of Africa's most celebrated icons, took power at only 33 in Burkina Faso through a coup. He was helped by other youthful collaborators and close lieutenants like Blaise Compaoré. Again, the take-over was the result of dissatisfaction with corruption among the political elite and overall bad governance. In these two examples and many others, the coups succeeded and garnered support from the population in general and the youth in particular. But the frequency of coup d'états as a means to power has declined in Africa over the years. This could be because coup leaders often renege on their initial promises and become more brutal and dictatorial than the systems they sought to change. In Libya, for example, the 27-year-old Colonel Muammar Gaddafi seized power through a coup and governed by dictate until his ousting in 2011 after 42 years in power. And in The Gambia, a 29-year-old junior officer, Yahya Jammeh, overthrew Dawda Jawara's government in 1994. He and four fellow junior officers governed by decree until elections in 1996 made him a civilian president. For 21 years Jammeh reigned over The Gambia with an iron fist until he was defeated in the 2017 elections. According to US datasets, the current decade has witnessed around 16 coup attempts in Africa as opposed to over 35 on average in previous decades. African states are being urged to adopt democratic norms. This means that the youth are now exposed to good governance doctrines that reject forceful power grabs. Young people, who constitute over 60% of the continent's population, are displaying their discontent with political leadership through other means, such as organised protest action. Coups are traditionally associated with the military, but through protest and political activism, the youth are carving a niche through which lasting change can be achieved. Credible institutions such as the African Union (AU) and Regional Economic Communities have also contributed to the decline in coups, through their backing of democratic norms and reforms. Article 23 of the African Charter on Democracy, Elections and Governance states that any unconstitutional change of government will lead to sanctions for AU member states. The charter reaffirms the call in the Lomé Declaration (2000) for united opposition against coups. Coups need to take their rightful place as a relic in the transition from authoritarian rule to inclusive governance and democracy. Africa's youth must be encouraged to shun coups and thereby reject violence, force and intimidation. Youth should be placed at the centre of good governance initiatives. By so doing, power grabs through coup d'états will shift to their rightful place - the unpopular extremes of the policy environment.